Start dominating now, in PVE & PVP with The Division Hack Join us and get Instant Access to our software after purchasing. Download The Division Hack Now! Dominate in the dark zone with our deadly bone aimbot, full esp, radar, and our powerful no spread and no recoil features. 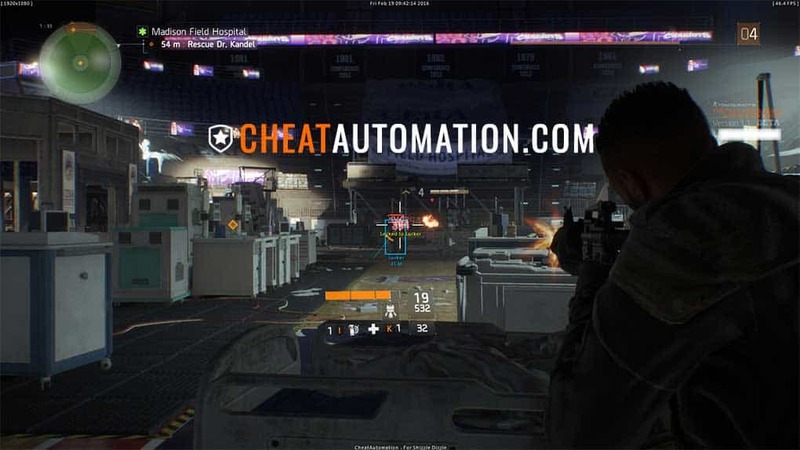 Enhance your abilities with CheatAutomation’s The Division Hack. 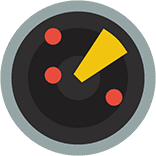 Using our software, lock on to your opponents with our precision bone aimbot with enhancements like no-spread and no-recoil which ensure you have the minimum Time to Kill. 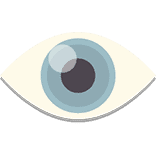 Scout out NPCs and other agents alike with full 3D ESP including tracelines that let you see the exact positions, statistics, and even camera direction of other players whether you’re engaged in PVE or hunting agents in the Dark Zone. Level up at a blistering pace, as you earn maximum exp from cutting down NPCs left and right, and dominating missions on hard and higher difficulties with the help of our The Division Cheat. Gear up with the best gear from instances and use our cheat to hunt rare bosses in the Dark Zone or go rogue to earn hundreds or thousands of Dark Zone Cash to unlock the best armor, upgrades, and weapons available. 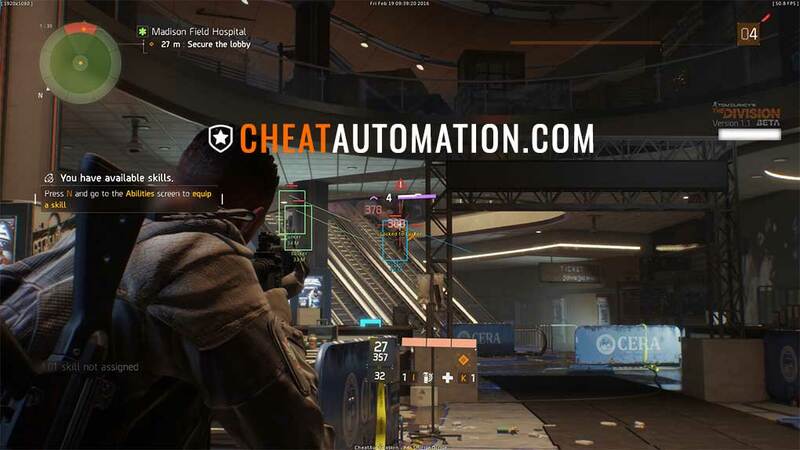 Our The Division hack is designed to be secured against anti-cheat and safe to use, with multi-layer security measures in place in both the cheat, and our secure cheat launcher which ensures you get an undetected cheat upon loading. 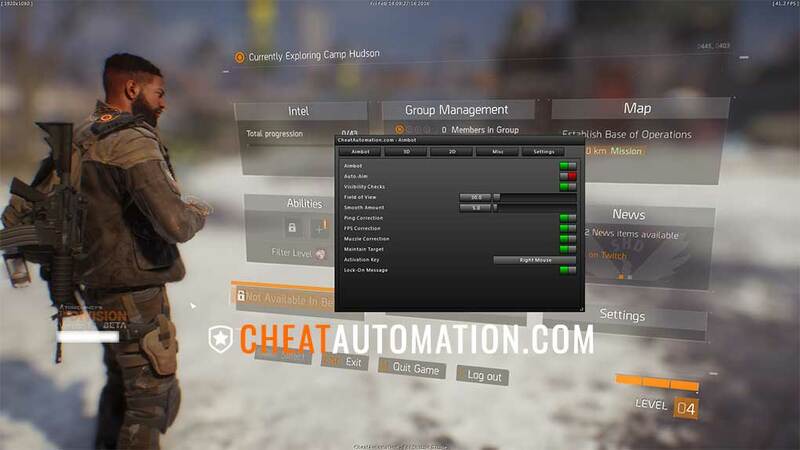 Configure all your features, from the fully customizable ESP with options like nametags, boxes, health, skeleton ESP, tracelines and more, to movable and resizeable 2D radar, and multiple aimbot options including field of view, smoothing, bulletspeed correction and more through the Division Cheat’s in-game menu that makes customizing every option as easy as possible. Save and load your features to keep your perfect setup ready at all times. Download our killer cheat for The Division Now! Looking to gear out with the best end-game gear, dominate in the dark zone, and hunt down the hunters in survival mode? 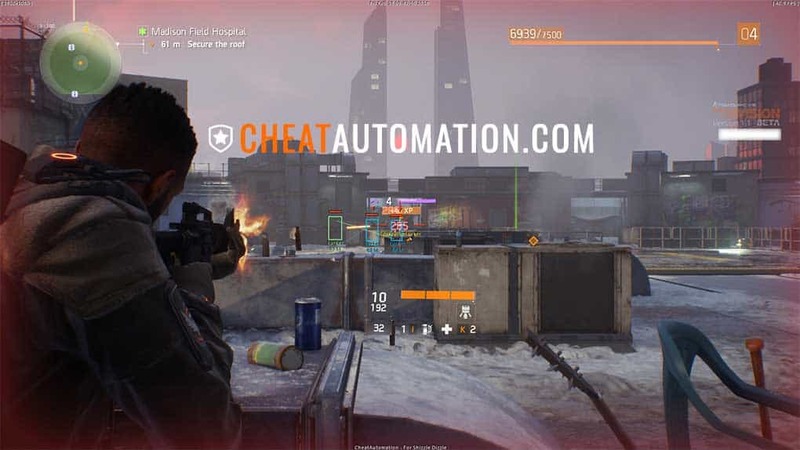 With Cheatautomation’s The Division hack, you can give yourself a massive advantage in tactical information, along with increased accuracy and DPS. 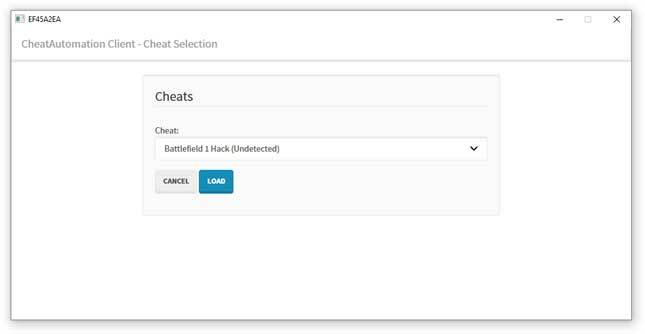 Our cheats will enable you to take down anyone who stands in your way. In The Division, as an agent, your job is to take back new york city from the gangs while helping the survivors of the virus attack. You’ll have to gear your character up to take on the toughest challenges in instances and open world PVP. The Division ESP hack features let you see the locations of all allies, enemies, players, and loot pickups, giving you a massive advantage in your tactical awareness. In the dark zone, knowing where other players are can be the difference between life and death. With ESP, you’ll know where every enemy NPC is, and this can be critical when you are taking on hunters in the DLC Survival mode. Hunters can quickly take you down, so knowing where they are coming from will let you prepare for them with ease. The Division hack ESP also lets you see all the loot pickups in an area. This feature alone will double your loot, as you’ll never miss a loot crate or pickup again, helping you gear up faster than ever before. When it comes to taking down opponents, you want to maximize your accuracy and DPS, and the Division hack is a big help there as well. With our silent bone aimbot, you can lock onto anyone and spray them full of bullets, without even adjusting your reticule. 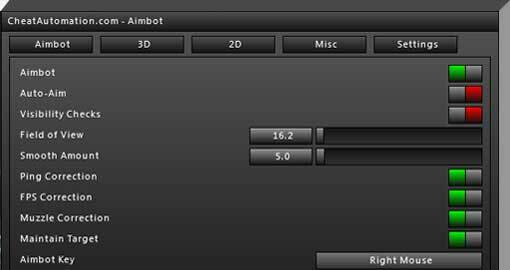 The aimbot will lock on and can be configured for shot distribution and accuracy. 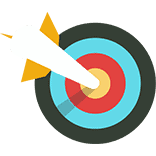 For instance, if you want to look like a legitimate player you might cut your accuracy down to 80%, and balance the shot distribution over some body parts from the chest to the head. Or, if you’re using a bolt-action rifle, you might prefer to go with straight headshots for maximum DPS and killing power in the dark zone. The Division hack has two other features that can greatly increase your overall accuracy and damage. These are ‘no spread’ and ‘no recoil.’ With these features, you can disable your weapon’s bullet spread and recoil, ensuring every bullet you fire goes exactly where it’s supposed to. 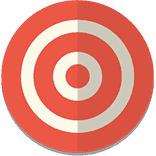 These features eliminate missing your shots altogether and will therefore greatly increase your damage per second over what other players can achieve with the same weapon. Imagine firing full auto with a light machine gun and every bullet hitting its mark. 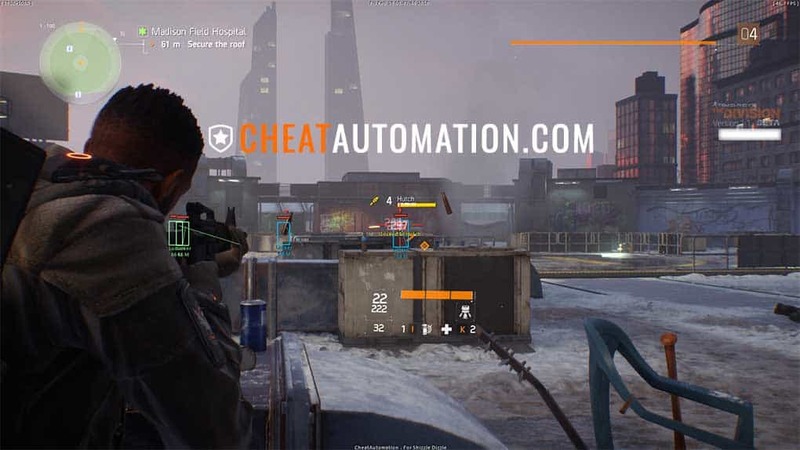 That’s what’s possible with Cheatautomation’s private The Division hack.